COR NOR: Wow- it feels good to be able to force myself to make it through a tough workout knowing my F3 brothers are out there in the gloom elsewhere getting better too. Prayers for Captain Crunch at his conference in Seattle, Banks for his 5K on Saturday, continued recovery for Avon and Jazz Hands. 4 PAX woke to a very springy (and squishy) morning in the gloom: Archive (QIC), Banks, Captain Crunch, Jazz Hands. Flora 1-2-3: Partner up. Goal- 100 merkins on coupon, 200 LBCs with coupon, 300 coupon goblet squats. Flip-o-rama with partner at 10, 20, 30 reps respectively. Bonus! No running- hold plank during merkins while partner does 10 reps, hold coupon above chest for LBCs, hold at bottom of squat. NOR COR- A good day out in the gloom. Prayers for healing Jazz Hand’s back and shoulders and for motivation for the rest of the group. Thang 1: Squat Ladder- Descending reps of squats (20, 19, …) at top and bottom of hill. COR, NOR, Thanksgiving for the recent F3 trip to Peru- A visit from Chelms- Prayers for motivation, safe travels, and growth. 5 High-Impact Males posted at Mastodon this morning. They didn’t come merely to survive, but to thrive! Fitness, Fellowship, and Faith are the elements that keep me going in life. Faith: We are made for something more, not merely to survive as biological creatures, but to thrive as humans. We have a purpose, to be good stewards of creation, to live with and for our fellow humans, to bring love, mercy and justice to the world. We are part of the Almighty’s work of redeeming and restoring creation to be what it was originally meant to be. Fellowship: And we do that together. Henry David Thoreau said that “men lead lives of quite desperation.” He hits on a truth—that we tend to live in isolation, even when we are around others. It takes intentional interaction, like we have at F3, to thrive as men, to fulfill our purpose as humans. Fitness: This is also about thriving, not merely existing. It is not about glorifying our bodies, but about being capable of fulfilling our respective callings. And it serves to break down barriers between men, so that we can engage in Fellowship and Faith! For healing from illness among PAX and their families. 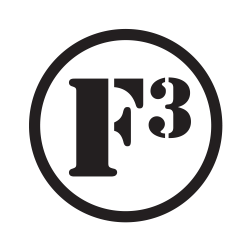 For the growth and encouragement of the men of F3 Wheaton. For prayers unspoken. That we would be agents of grace and truth in our homes and communities this weekend. Thanks for the opportunity to share the gloom with you! Prayers for safe travels for Jorts, and regaining health for Captain Crunch. Two PAX busted through the gloom (Archive QIC, Captain Crunch). WOR- 7x Motivators, Lunges, Backwards Run. Thang 1- Bataan Death March: Indian run with burpees. Thang3- Spartan- Run to top of the hill, 10 merkins at top. We did 5. COR NOR- Prayers for the group, for rest, and giving thanks for a misty morning. 3 Pax punched through the gloom. COR NOR Archive, Captain Crunch, Banks. Gave thanks for a good morning to get stronger and more disciplined. 2 PAX (Banks, Archive) woke up to sweat it out. 15x: Side Leg Raises, Front Leg Raises, Side Plank, Merkins, Dips. Fliporama. Burpee Mile- Cut a 1/4 mile short by Archive (QIC) having to poop. Nothing like a sweaty dump. It was a good morning to be out there, besides having to clench it for the entire Burpee Mile. Captain Crunch was coming back to 100% after a virus. Major respect to Banks for pushin through all the running and taking time from his busy schedule (school, job, family) to wake up to get better. Two local PAX were met by one South Carolina PAX as the sun threatened to rise. The weather was already perfect, so with some brief introductions we got down to business. Gratitude for the weather, blessings on Harry Caray’s mom as life and relationships shift a bit, continued prayers for R&R at the Archive house, and for parenting that is full of love, patience, joy, kindess, and peace at the Crunch house. Closing thoughts: It was fantastic having Harry Caray doing F3 back in his homeland, and completing his circuit to all of the Chicago AOs. We had more exercises planned to complete the theme, but doubling up the hill runs definitely fulfilled the “life was hard” and the “I’m going to complain about this now” aspects for this Q. Archive and Harry made it look easy.